In a thrilling final showdown at the Tops International Arena, Niels Bruynseels (BEL) and Lady Cracotte powered to victory in the last class of the weekend in the Longines Global Champions Tour of Valkenswaard. The last day of competition at the venue - which celebrates 25 years of show jumping competition- saw plenty of drama, but it was the lightning fast Belgian rider Bruynseels who denied home hero Eric van der Vleuten (NED) the win with Zigali P S, the popular Dutch rider finishing second and just ahead of World Number 1 Harrie Smolders (NED) with Zinius. A delighted Niels praised his horse, saying “It’s only because of my horses that I can win - they fight for me, and make it easier for me as a rider. I was lucky I could see Harrie’s jump-off so I knew what I had to do. I also knew there were some very strong riders behind me so I took a few chances, left and right. To be honest I didn’t think it was enough to win. It’s nice to have my owners - who are also the breeders of this horse - here, and it’s nice for them!" Uliano Vezzani’s final 1.50m course of the weekend featured a Tulip-winged triple bar to start, an eye-catching bicycle fence, and a delicate Sapinda vertical. The treble combination set down the middle of the arena proved to be one of the trickier challenges, with all elements falling if riders were unable to get the perfect line to it. A double of ditches caught out a few of the world’s best and the final line was a technical test - come in on a forward stride and you were in danger of taking out the final fence - a narrow Stal Tops vertical - which fell time and time again throughout the first round. Christian Kukuk (GER) and Colestus were one of those early to go clear, the big striding horse confidently ridden by the young German talent. He was swiftly followed by Pieter Devos (BEL) with Gin D, with an exciting jump-off for Sunday’s final showdown on the cards. There were some unusual refusals, the horses having plenty to look at in the expansive arena. Last minute stops for LGCT ranking leader Ben Maher (GBR) with Don Vito ruled them out of contention, and there were retirements from Alberto Zorzi (ITA), Daniel Bluman (ISR), Gerco Schröder (NED), Jessica Springsteen (USA) and Pedro Veniss (BRA) to name just a few. But there were plenty of stars who made it through to the jump-off, with Eduardo Álvarez Aznar (ESP) with Seringat, Niels Bruynseels (BEL) with Lady Cracotte, Daniel Deusser (GER) with Tobago Z, Eric Lamaze (CAN) with Chacco Kid, Jos Verlooy (BEL) with Caracas. Local hopes would be raised as Harrie Smolders (NED) with Zinius, Jur Vrieling (NED) with Zypern III, Leopold van Asten (NED) with VDL Groep Miss Untouchable, Eric van der Vleuten (NED) with Zigali P S all made it through - four out of ten in the jump-off would be Dutch riders. First to return to the ring Christian Kukuk (GER) came back with plenty of confidence, however the pair took the turn back too tight and Colestus refused the planks, dropping them right out of the order. Pieter Devos (BEL) set off at a galloping pace, but a stop as they approached the double meant they too would be sidelined from a top result. 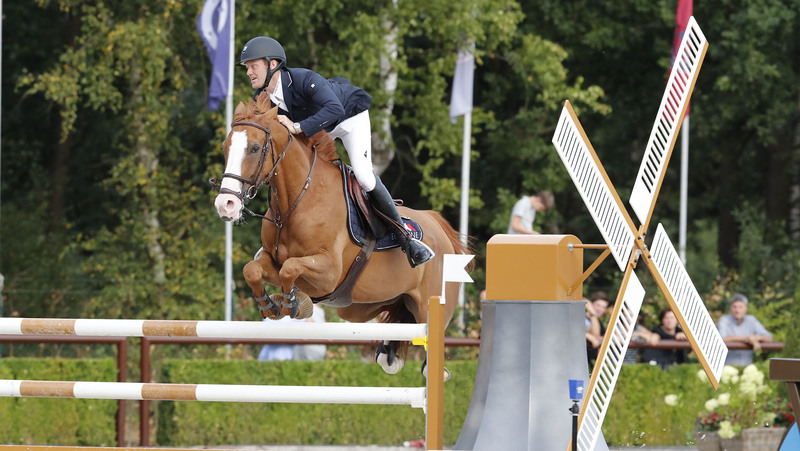 It looked as though the jump-off course would prove tough, as first of the Dutch riders Leopold van Asten (NED) also collected a fault, much to the disappointment of local spectators. Eduardo Álvarez Aznar (ESP) chose a different tactic with Seringat and was the first to go clear, putting in a steady round in 49.03s - knowing that it could leave him with a chance, but also that the door was wide open for the rest of the world class field to come. Local rider Harrie Smolders (NED) entered the arena to cheers, always a dangerous contender with the ever-fast Zinius. The pair powered around the course, the World Number 1 finding the perfect stride to stop the clock in 42.31s - smashing Aznar’s initial pace setter and raising the bar for those behind. The Dutchman’s time looked unbeatable, until Niels Bruynseels (BEL) and Lady Cracotte picked up the pace in the second half of the course, flying through the finish gates with a new time of 41.45s, almost a full second faster than The Netherlands' home hero. Daniel Deusser (GER) and Tobago were met with disappointment as the Longines vertical fell, and Eric Lamaze (CAN) also clocked up four faults with Chacco Kid. The last hope for a Dutch win rested on the shoulders of experienced rider Eric van der Vleuten (NED). A brave turn put him up on time with Zigali P S, taking a chance to the last as the crowd roared in appreciation. But it wasn’t to be, the pair stopping the clock in 41.70s, just milliseconds behind the Belgian rider. Final rider to go Jos Verlooy (BEL) chased his compatriot Bruynseels all through the course, but a check to the final fence with Caracas would see them finish clear but with a slower time of 42.36s. So it would be a win for Niels Bruynseels (BEL), with Eric van der Vleuten (NED) and Harrie Smolders (NED) in third. The Longines Global Champions Tour now looks to Rome, Italy, for the 15th leg of the 2018 Championship race.